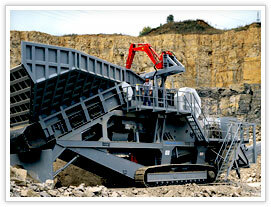 On December 16, 2009 the hydraulic cone mobile crusher plant have sold to an Ecuador quarry company. SBM Cone Crusher Series Mobile Crusher Plant can be widely used for crushing and screening in many areas such as road construction, building, metallurgical and energy industries, etc. Always make the customer with satisfaction. “Customers are increasingly recognising the benefits of these high performance, low wearing units,” asserts Hyman. “The hydraulic cone crusher on the mobile unit is highly regarded in the Ecuador quarrying industry, ” he notes. "Customers in the mining and quarrying sectors need to use equipment that works with maximum efficiency and productivity and our hydraulic cone crushers deliver," Hyman says. “Add to the hard-working hydraulic cone crusher the efficiency and mobility of a track-mount, and you’ve got an unrivalled package,” he enthuses.